The focus on China has overshadowed Japan’s increasing presence in the region. In Sri Lanka, China has been responsible for major infrastructure projects, and was able to take over the Hambantota deep sea port due to the inability of the Sri Lankans to pay off their debts effectively. This would significantly increase the capability of China to influence the major trade routes that pass through the Indian Ocean region. Japan recently donated two patrol craft for the Sri Lankan coast guard, with each vessel costing nearly $11 million. Japan’s move shows its willingness to take steps in order to counter China’s increasingly entrenched presence in the region. Another promising area for Japan currently is Nepal. Japan happens to be a very important trading partner for Nepal and accounts for a major chunk of Foreign Direct Investment in the country. At a 2017 investment summit held in Kathmandu, Nepal, Japanese investors put forward figures as high as $1 billion for investment in the country. More than 60,000 Nepali nationals reside in Japan and the number is set to grow with an increasing number of Nepali students heading to Japan to pursue higher studies. Sister city relations have also been established between Koyasan in Japan and Lumbini in Nepal. Increasing Japanese influence in Nepal is sure to discomfit China, especially considering the fact that Nepal shares a border with Tibet. 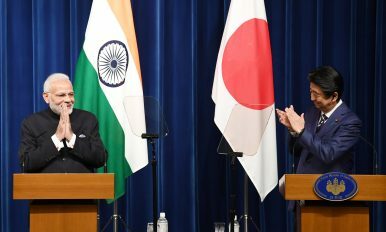 India acts as a cornerstone for Japan in South Asia and Tokyo is deepening cooperation with New Delhi across all sectors – economic, diplomatic, cultural, and military. Japan is considering taking up a role alongside India to develop the strategically important port of Chabahar in Iran, which would act as a counter to the Chinese-backed Gwadar port in Pakistan. There are plans for Japan to construct an industrial complex as well, which would constitute a significant investment in the project. Japan has also pledged billions of yen in investment for projects such as hydroelectric power generation, sustainable forest management, and road construction in India’s Northeast. The Northeast is a strategically important region as it shares borders with China, Bangladesh, Myanmar, and Bhutan. It forms a part of the Indo-Japan corridor, which comes under the ambit of the larger Asia-Africa Growth Corridor. China claims the Indian state of Arunachal Pradesh as a part of its territory, calling it South Tibet. China says that it is opposed to any foreign investment in the “disputed areas” but that has not stopped Japan from its activities in the region, showing that Tokyo is not afraid to ruffle a few feathers. Japan has been gradually changing its pacifist constitution and certain sections are being reinterpreted to allow for a more aggressive Japanese military. India is an important partner for Japan in its defense cooperation and talks are ongoing between Japan and India to set up an Acquisition and Cross Servicing Agreement (ACSA), which would allow the militaries of both the countries to provide supplies and support services to each other and access each other’s bases. Access to bases would mean that Japan would be able to use India’s bases in the Andaman and Nicobar Islands and the Lakshadweep Islands. This would increase the operational reach for the Japanese navy and would allow it to better protect its interests in the region. By entering into agreements with regional powers such as India, Japan is solidifying its presence in the South Asian region in a sustainable manner. It is following a partnership model in South Asia where it engages with nations on equitable terms in order to create a solid basis for cooperation. The Indo-Pacific region is becoming increasingly important due to the rising economic and military prowess of the Asian nations, with China leading the way. The majority of the world population resides within this vast region and it contributes more than half of world GDP, with nearly half of world trade passing through the region as well. South Asia presents itself as the other half of this Indo-Pacific region and for Japan to maintain its status as an important power in the region it has to ensure a visible presence in the countries of the region. It is in Japan’s interest to present itself to the countries of the region as an alternative to China, especially considering the fact that resentment against China and its invasive influence is slowly on the rise in countries such as Sri Lanka and even Pakistan. To this end, Japan is working slowly but surely in order to ensure that its strategic presence in South Asia is built up in a solid manner. Sarbhanu Nath is a Master’s student at the Department of Geopolitics and International Relations at Manipal Academy of Higher Education, Manipal, India. A burgeoning nuclear export portfolio carries with it significant risks and responsibilities.